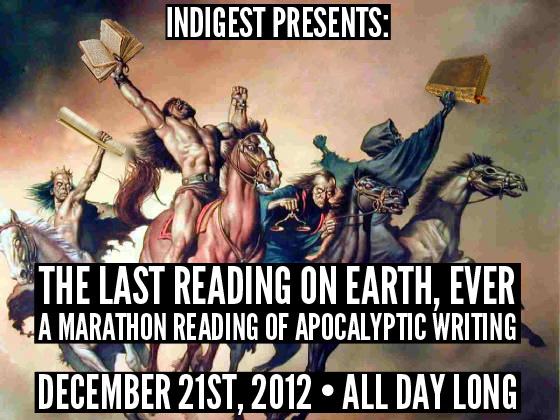 The Last Reading on Earth, Ever was an online marathon reading of apocalyptic writing hosted by InDigest for the Mayan apocalypse prediction on December 21st, 2012. The reading was featured on MPR's The Current and other press outlets. The marathon featured readings from Lizzy Acker, David Atkinson, Albert Balasch, Joseph Bates, Caren Beilin, David Blair, Amaranth Borsuk, J. Bradley, Emily Brandt, Marc Capdevila, Heather Christle, James Cihlar, Ryan Collins, Lucy Corin, Paul Dickinson, T.M. De Vos, Adam Fell, Elisa Gabbert, Amelia Gray, J.C. Hallman, Matt Hart, Geoff Herbach, Steven Karl, Becca Klaver, Miles Klee, Gregory Lawless, D.W. Lichtenberg, Brad Liening, Michael Martone, Matt Mauch, Adam Moorad, David Moscovich, Dustin Luke Nelson, Nathan Oates, Joseph Michael Owens, Bradley Paul, Kathleen Rooney, Christopher Salerno, Paul Siegell, Bianca Stone, AE Stueve, Mathias Svalina, Maureen Thorson, Leah Umansky, Ellen Welcker, and Rachel Zucker.